The first lesson the universe had for me was to take away my foundation of reality! It began in my childhood home on one ordinary night and not unlike any other. My family all went to sleep and as I had done many times before, I got out of bed in the middle of the night. I quietly took my blanket and laid on top of the heater vent in the hallway. The vent came up through the floor in the middle of the hall at the top of the stairs. It was centered between four bedrooms and a bathroom on the second floor where I would often fall asleep. I first believed it was a ghost but later experiences brought me to the conclusion that it was more likely an extraterrestrial. OK but now several years would pass and the next event would change me permanently. It was what I�ve heard referred to as a plasma UFO and now I began to think that someone was trying to get my attention. Now the first visual event of the little boy wasn�t a fluke anymore. Now I�m about 11 or 12 and WOW! What the hell is that in the sky, Venus? It must be a planet I thought. I�ve heard about these things before, colorful lights always turn out to be a planet. But it couldn�t be a planet because it�s too big and close and moving too weird. Let me back up about five minutes. I was just an average boy and there I was walking home as usual one summer night. When I got to my street one block from the shoreline I took a left at the Town Beach Park. It was a small dimly lit neighborhood park with a few picnic tables and a swing set area. My house was only four short blocks away. I walked another block where my street crossed the main road in and out of my neighborhood. There was never much traffic at night, except for area residents. When I crossed the street, something in the sky caught my eye. 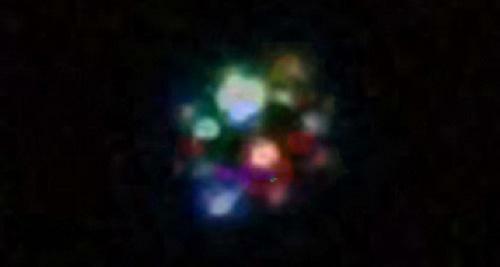 A very large multi-colored luminous cloud like object appeared. It was a clear star lit night with no clouds in the area. The object was about the same altitude as a low cumulus cloud so I would have to judge the size to be about a mile wide. It was slightly oval horizontally but not rounded. I would describe it as globular. It was what appeared to be a luminous plasma made up of about twelve different distinct but separate colors. They were each somewhat globular as well, forming the whole. Each of the colors was changing shape and size while adjacent colors would either contract or expand in response. There were no borders between the colors and they were bright, saturated and fluorescent in appearance like neon. The overall size of the entire plasma cloud didn't vary during the expansion and contraction of the individual colors. It was completely silent and as you can imagine, I was stunned frozen. It was both amazing and beautiful, but what was it? I�d never seen anything like it before or since and I�ve told the story so many times I can remember it like it was yesterday. I seemed perfectly centered from left to right, beneath it and it was about 30 degrees south from directly over my head. This placed it over the shore of the Town Beach. There was nothing on that side of the street so my view was unobstructed. After about 30 seconds, the thing just shot straight back and disappeared into a clear sky full of stars. Then suddenly, as quickly as it shot away, it came straight back to the same exact position and size with all the colors in the exact same places they were. It was only gone for about ten seconds. The speed was astonishing it took less than a second or about a second to travel the distance. From about a mile across to hundreds or even thousands of miles away in one second, WOW! It took no more than a second to return too. I remember thinking, �this is weird and I don�t think it�s from here� but here it was again. Above: This is an actual public domain UFO photo I found online and Photoshopped to add more colors. Not what I saw but similar. The next day, my brother told me that in the paper that other people reported it and that it was gases escaped from a test rocket. That cover-story never sat right with me, I never heard of anyone testing rockets over populated New England towns. Anyway, since when does escaped gas take off and come back four more times before actually escaping? Now, what you should know is that the last contact was about a year ago which left physical marks on my person. Another thing is that a lot of very strange things have been happening to me since the first two contacts. These things probably number into the hundreds. However, it was the second encounter that altered my perception of reality. People have asked me if I was abducted, if it was aliens, if they did something to me? I don�t know if I was abducted I didn�t check the clock for missing time. I hadn�t heard the UFO missing time stories back then. From what I understand however from a contact investigator and from documentaries, altered reality and extraterrestrial contact go hand in hand. Many people who have reported encounters have also reported lingering or permanent altered realities. Increases in paranormal activity, increases in synchronicity, psi events and so on. Also it has made me much more open to spirituality. Anything to me is now possible including the possibility of a greater consciousness and higher states of existence. I also feel a silent invisible presence just observing me, an almost tangible entity just beyond my five senses. I know it�s there and I know it�s aware of that. I don�t know what it or they are or what it or they want but I can psychically sense an existence just beyond my physicality. This article was written using excerpts from the non-fiction book �Sin Thesis� available at Amazon written by the author Robert Torres. Article Copyright� Robert Torres - reproduced with permission.